Rising oil prices and new environmental regulations represent enormous challenges for manufacturers of large engines. The same is true for their customers: In an era of growing global competition, shipowners, railway companies, or power plant operators, for example, must keep their operating costs under control. And certain maritime zones can now only be entered by vessels complying with strict limits. New technologies reducing fuel consumption through engine control play a particularly important role in this situation. Moreover, reliability is crucial, especially on the high seas. Bosch Rexroth provides solutions for engines that fulfill those requirements. With us, you get all hydraulic and pneumatic components required for the operation of low-speed engines from one source. This includes FIVA valves, axial-piston variable displacement pumps, for start-up units, logic control valves and directional valves and pneumatics systems and components. These products are high quality and extremely reliable, allowing you to avoid unplanned downtimes. At the same time, they come with optimized fuel injection and exhaust gas recirculation systems to enable compliance with emission standards. Lower your TCO in a clean and reliable manner - for example with the FIVA valve, which implements the injection profiles provided by the control unit with utmost precision. This allows manufacturers of two-stroke marine engines to reduce fuel consumption and emissions. By sticking exactly to the ideal profile, the FIVA valve guarantees highest performance and boasts excellent dynamics and repetitive precision. Bosch Rexroth specialists start working for instance with ship outfitters already in the earliest development stages of a project. We make full use of our application-specific know how and decades of experience in order to find the best possible solution for a specific application. We therefore employ state-of-the-art test procedures in the development of these solutions and use the latest calculation and simulation technologies in analyzing vibrations and component deformation. This is followed by prototype testing and optimization. All of these factors enable Bosch Rexroth to guarantee the highest standards. 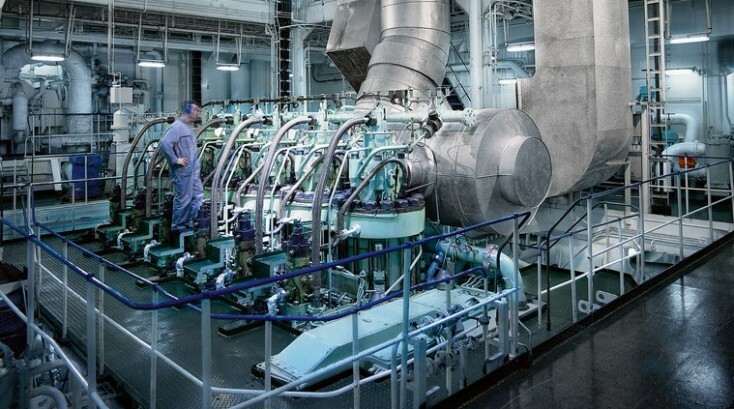 Engine failure leads to high costs, especially in maritime applications. It is therefore crucial to prevent component failure outside of the scheduled maintenance requirements. In addition, maintenance times should be used effectively. In order to support ship operators in their routine maintenance, lower maintenance costs and guarantee timely availability, Bosch Rexroth maintains a network of service stations at all major ports. Special REMAN exchange programs for pumps ensure fast access to spare parts throughout the entire service life of the engines. Thanks to its setup, experienced specialists and worldwide presence in over 80 countries, Bosch Rexroth is an ideal partner.